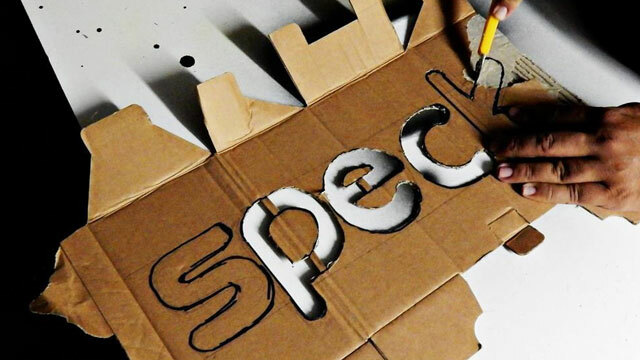 Speck enlists graffiti artists to spray down some iPhone cases at the Miami Mini Maker Faire, and boy do they! We used masking tape to secure the cases to the plywood. La Mano Fria, from Miami’s GPK Crew, used an exacto knife to create a stencil. Broeknows, from Miami’s GPK Crew, tagging a case for a patron. Fine Family fun for all! Ayanna interacting with a patron. Ramon demonstrating the sturdiness of our HandyShell. Patrons posing with artist La Mano Fria. One of our youngest patrons was very proud of her cupcake (*) SPECK case for her iPod Touch. Sarah got her case personalized by Broeknows. Patrons of all ages visited our booth.